Cut the stem off the pepper and deseed by rinsing quickly. Then roughly dice the pepper. Then combine all the ingredients in a food processor and blitz for a minute or two. Season if needed. Dressing done. Arrange the tomatoes and tomatillos on a plate with some chopped sorrel, like you’re making a Caprese, Texas-style. Then sprinkle the cojita over the top. Drizzle the fish and the romaine leaves with olive oil, then season both with salt and pepper. Grill the fish on medium-low for 10-12 minutes, or until done. When the fillets are almost done, grill the romaine for 10-15 seconds on both sides. The edges should just begin to char. 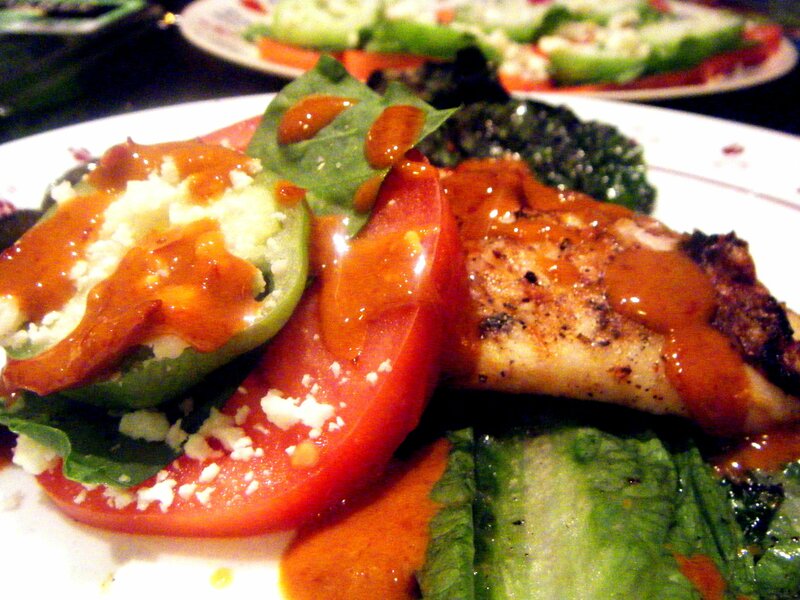 Place two leaves of grilled romaine on a plate, followed by ½ the fish. Next to that, place a couple of tomatillo stacks, and drizzle generous amounts of dressing over everything. Repeat, serve and enjoy leisurely. Playlist included So Nice (Summer Samba), by Bebel Gilberto. Because baby, right now, it’s cold outside.